A number of Christians were injured and hospitalized on Sunday when a Muslim mob attacked their church during a morning worship service in Pakistan's Punjab province, a Christian humanitarian group is reporting. 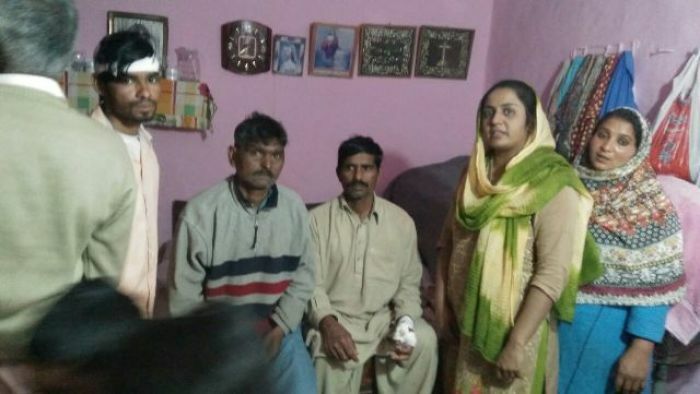 The British Pakistani Christian Association reports that the 9:30 a.m. service was underway at the Pakistani Gospel Assembly in the Sahiwal district when Pastor Cecil Daniel was forced to stop the proceedings to see what was causing the loud noise outside the church. What he and the rest of the congregants who followed him to the courtyard discovered was a group of approximately 20 Muslims with axes and sticks working to demolish a boundary wall surrounding the church. When the young male congregants tried to stop the group from destroying the church wall, the mob attacked. According to the London-based charity that is now working to assist the church, the mob attacked in an indiscriminate manner and some of the men even stormed their way into the church. Although the more severe beatings were suffered by the men of the church, some women were reportedly slapped in the face and had their clothes ripped, while some children were also slapped and kicked. The men, meanwhile, were hit with sticks and other items. Although a church member used his cell phone to call the authorities and warned the mob, the violence carried on until the sound of police sirens caused the attackers to flee. According to Daniel, the attack is believed to be a response to the recent installation of the boundary wall. The wall was built as a Muslim land owner named Tufail Rao, who owns property adjacent to the church, had expressed desire to take over the church property. According to BPCA, a mud church was housed on the property for over 20 years. But when a brick church was constructed on the land about three years ago, animosity was triggered among the local Muslim community. "The attack frightened our congregation. We did not expect such a reaction from Tufail Rao and his cronies," Daniel told BPCA. "We knew he wanted our land and that he could not stand that it had been dedicated to God, but his attack was nevertheless a surprise." Once the police arrived, they took witness statements and helped get the injured victims to a local hospital. Following the attack, church elders filed a police report at the Noor Shah police station. According to BPCA, at least four Christian men were sent to the hospital and the church boundary wall was severely damaged. The police took immediate action, launched an investigation and arrested the culprits. "Our brave young men obstructed the bandits and in the process saved the rest of the congregation from attack. They fought without weapons and may have broken bones and some bleeding but they are heroes to us," Daniel said. "God has been with us and created a listening ear amongst the local police who have been remarkably supportive. They have provided such wonderful assistance from the outset and I could not praise the officers at Noor Shah Police station anymore." Pakistan ranks as the fifth-worst nation in the world when it comes to Christian persecution, according to Open Doors USA's 2018 World Watch List. Although the attack on Pakistani Gospel Assembly seems to be an exception, police in Pakistan are not always cooperative when Christians seek justice for acts of persecution. "In a rare case of justice, Pakistani Christians have thwarted a land mafia attack that would normally resulted in extreme fear and eventual loss of Christian land," BPCA Chairman Wilson Chowdhry said in a statement. "By upholding the law, Noor Shah police have set a good precedent that is a small step towards a fairer Pakistan. By ensuring that the culprits are convicted and sentenced, the Police can ensure that the impunity that exists for crimes such as these no longer has an image of impregnability." The BPCA is raising funds to help repair the church's wall.